What a shock to the system. I feel for those people in the northern reaches Britain under a ton of snow. It's is unbelievable how cold and miserable it is. It gets into your bones – it even puts me off going out when I get the chance to find some early (or delayed) migrants. You have to feel for the birds too. Boy, have they been in for a surprise. Many have visibly delayed the crossing, waiting for it to warm up a bit, but their migrating instinct is strong and many have arrived only to be confronted by terrible conditions when in desperate need of nourishment. The story of the Puffins on the north-east coast dying in their hundreds, probably from starvation, is tragic, and there must be many other species struggling to survive. It has been noticeable how quiet it is as you walk around the countryside at the moment. Deathly quiet. The birds are too intent on clenching their bills in the cold than trying to sing. 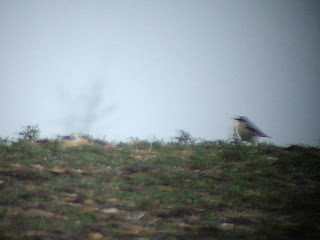 There have been many noticeable absentees on the local patch. Not one Sand Martin yet, for example, when we should have seen plenty by now. 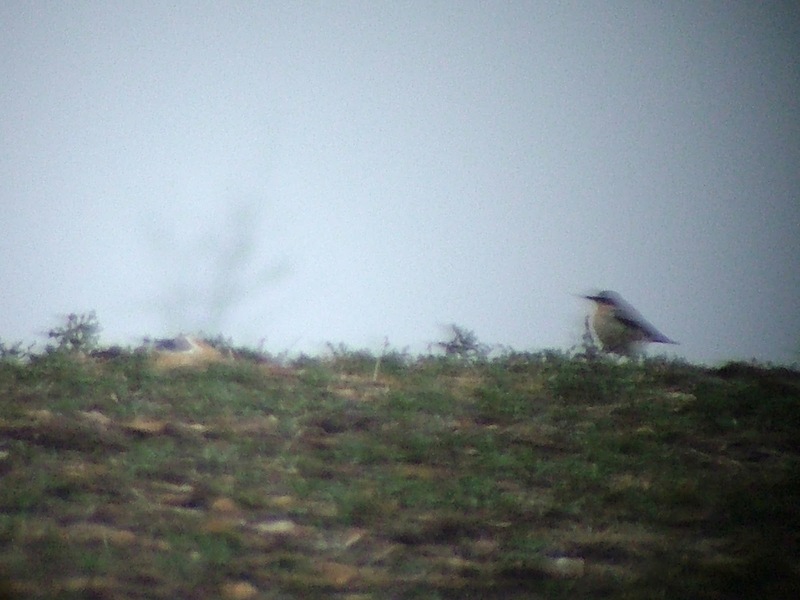 Chiffchaffs and Blackcaps are mute (I haven't seen either as yet) but there has been a male Wheatear up the road at Canons Farm I went to see last week, along with the resident Barn Owl. The highlight of the spring for me so far, however, has been the sight of an early male Ring Ouzel at Clandon Park, near Guildford today. Local Guildford birder Steve Castell found it yesterday and with the help of Matt Phelps (@SurreyBirdNews) – who announced it on Twitter and then found out its exact location for me – I went to Merrow Common and walked along the footpath towards Clandon Park for an attempted twitch this afternoon. I didn't hold out much hope when I found the right spot. The area is quite open and I couldn't see any sign of the Ouzel. 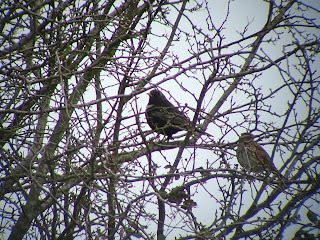 The thick hedgerow and small trees along the fence line looked the most likely place to see it but I only found a small flock of Fieldfares at first. After about 45 minutes walking up and down the path I was about to give up when a flock of Starlings flew out of a small tree, followed by the flock of Fieldfares and a handful of Redwings. 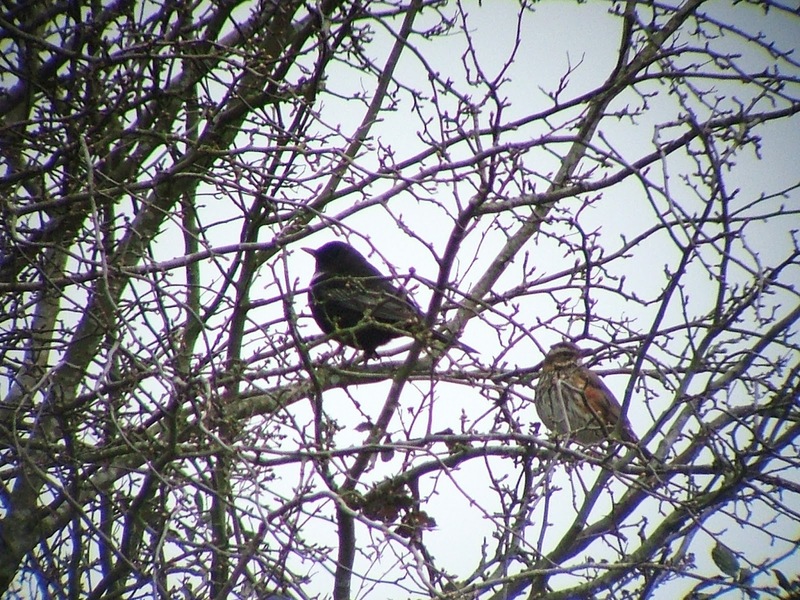 Still in the tree, however, was one Redwing and another slightly larger black bird. 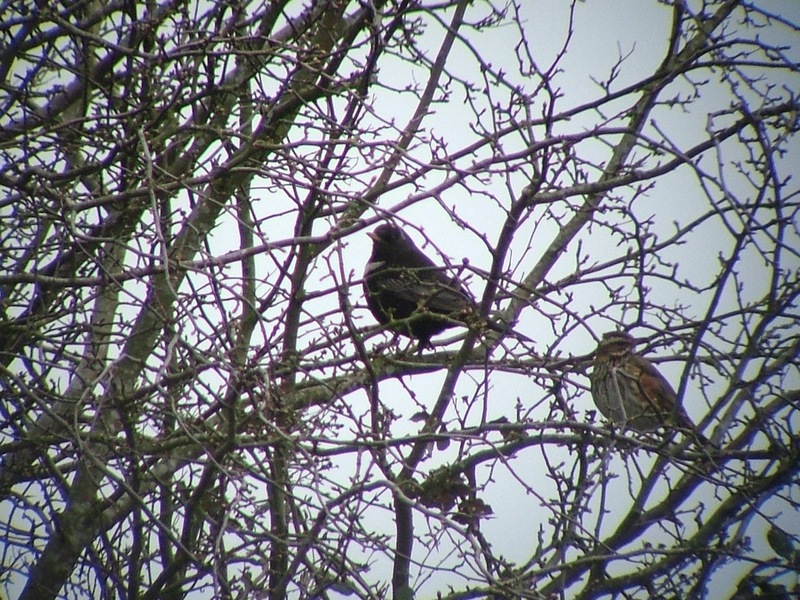 And there it was – the male Ring Ouzel. First view of the male Ring Ouzel - lucky to spot it! 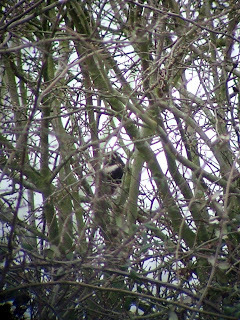 I kept a discreet distance as Ring Ouzels are nervous birds at the best of times, and this one had already clocked me. 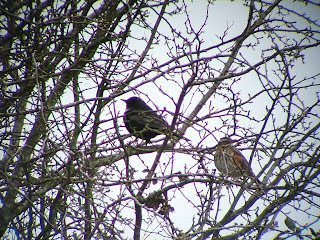 It had the Redwing for company for a while before it moved down the fence line. It was a chatty individual, breaking out into its distinctive 'chack', 'chack', 'chack' call on occasions – probably for my benefit – and I was able to watch it for a good 45 minutes before leaving. It was really good to have seen one this soon – I usually have to wait until David Campbell announces the first sightings of one or two at Canons Farm in early April.